Filament does not attach to the record. Posted September 22, 2017 · Filament does not attach to the record. I'm trying to run Ultimaker robot for the first time on our Ultimaker 2 Extended + 3D printer. But Filament does not attach to the record? What am I doing wrong? 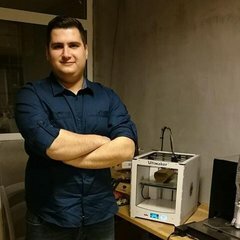 Is Ultimaker Robot set with the settings that should be? Or may I fine tune the settings myself? Have you adjusted and leveled the build plate? Posted September 23, 2017 · Filament does not attach to the record. First you see this video and calibrate the platform. The machine is on the balcony, under the air conditioner, and in front of from the door and window, take him away. And I think you should use glue. (This glue UHU Glue Stick. Dont try faber castell, and pritt(it does not work).